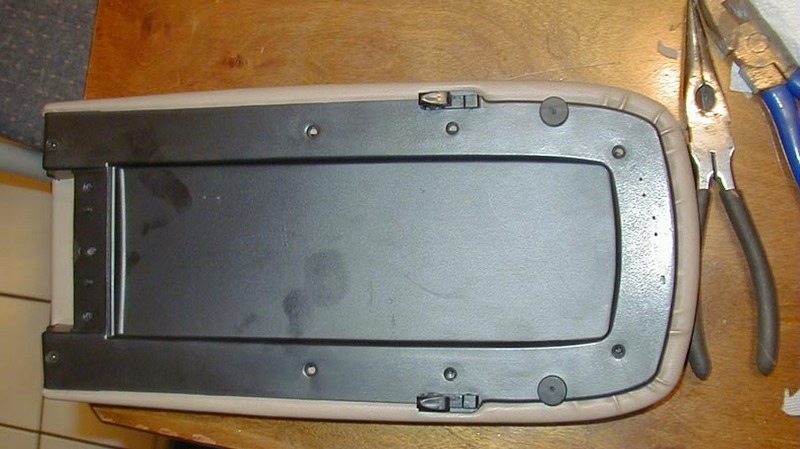 In September of 2003 I decided to recover my 1998 Mercury Mountaineer's center console lid. 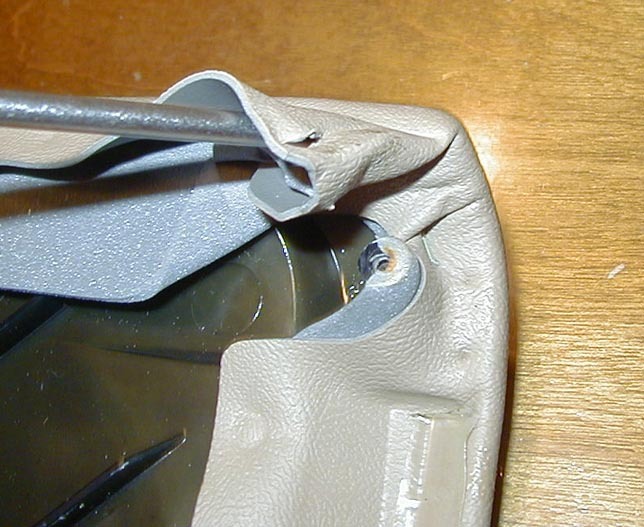 It had a small spider crack in the vinyl cover when I bought it in 2000, but it just continually got worse. 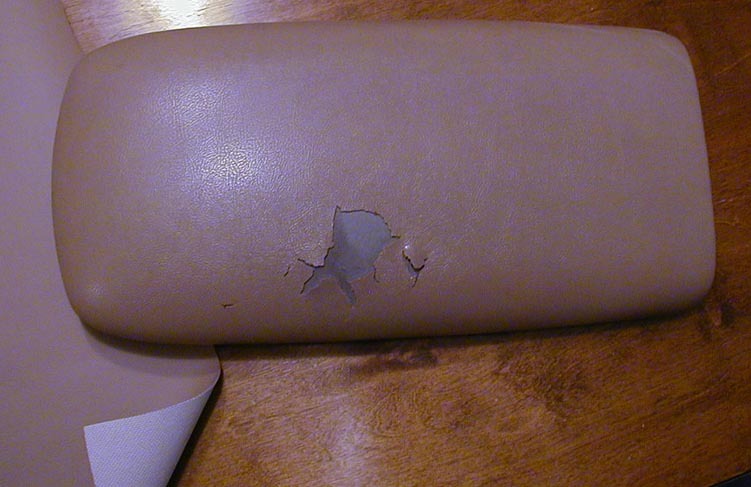 It was to the point where large chunks of the now brittle vinyl broke off. 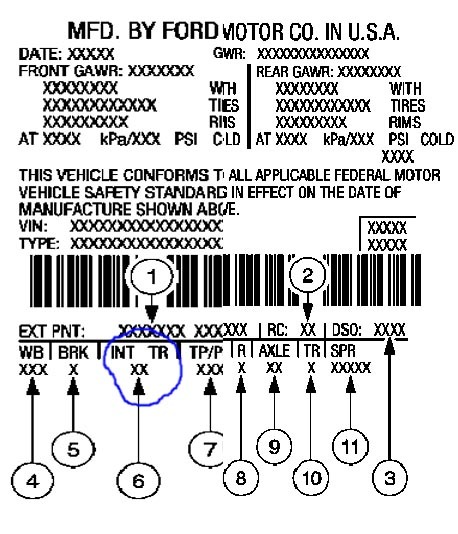 The interior trim codes are circled (number 6). 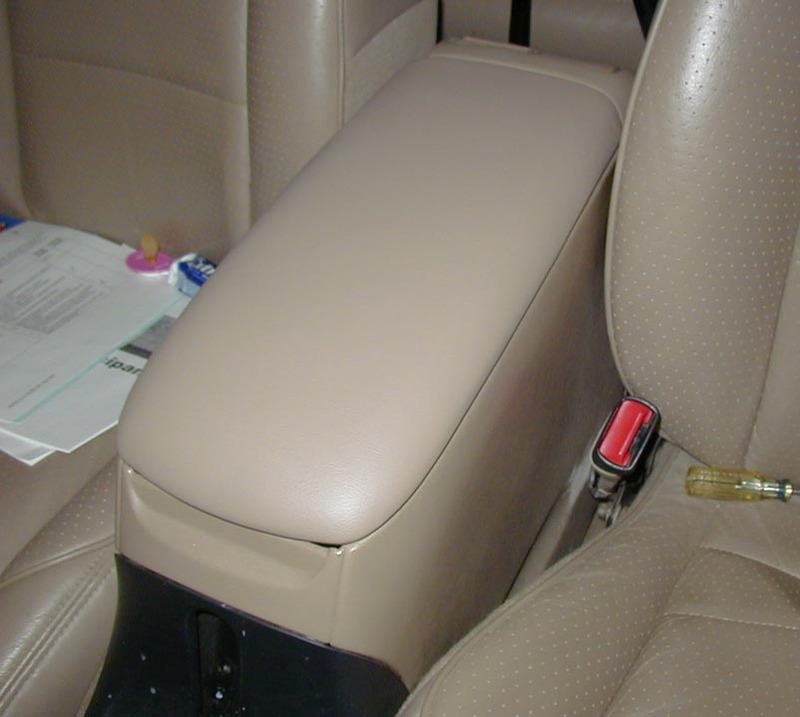 The first code is the type of interior in the vehicle. The second code character is the color code. 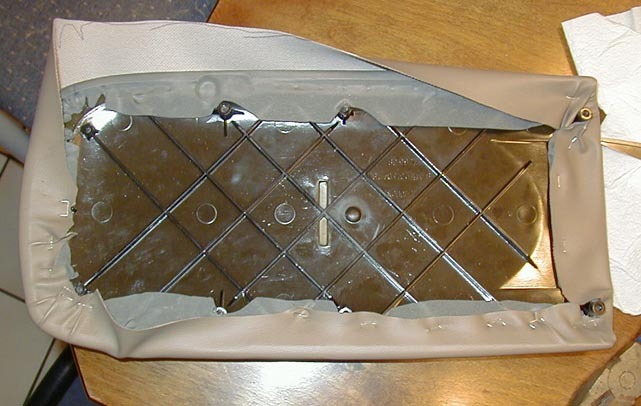 This is a picture of what the console lid looked like after I removed it. Don't be afraid to give this a try if your lid has a semi-hard plastic base with some foam material and a vinyl cover. 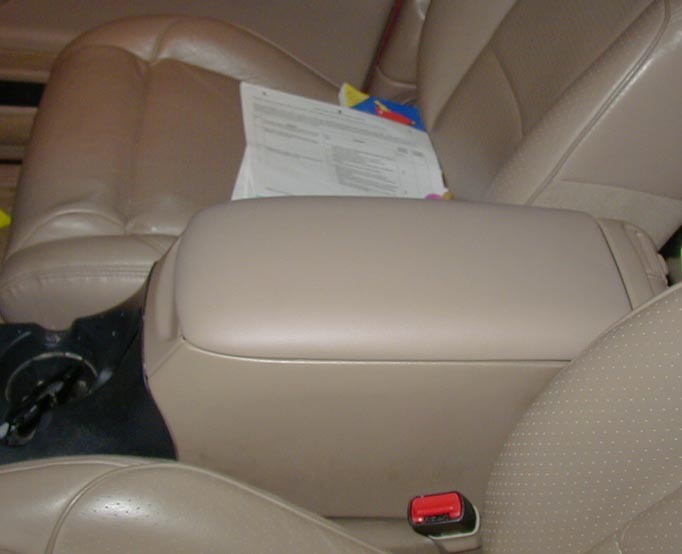 Even the leather interiors (my truck has leather seats) use vinyl on the console lid. I haven't ever tried this, but I have long ago dropped the fear of trying to fix something myself. I figure if I really screw it up I can always pay someone to fix it. Notice the new vinyl beneath the old covered lid. 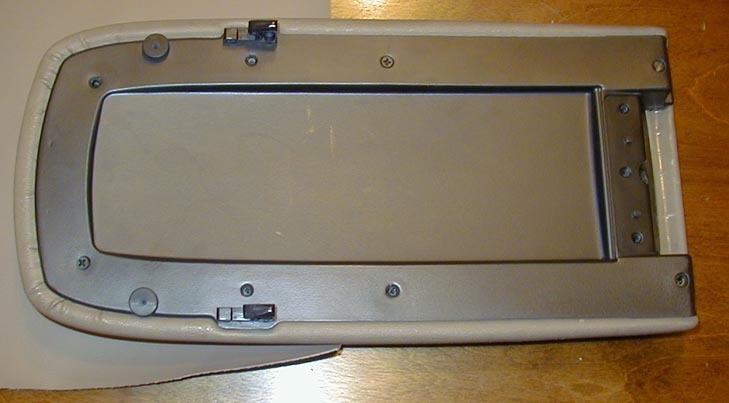 Here is what the underside of the console lid looks like. 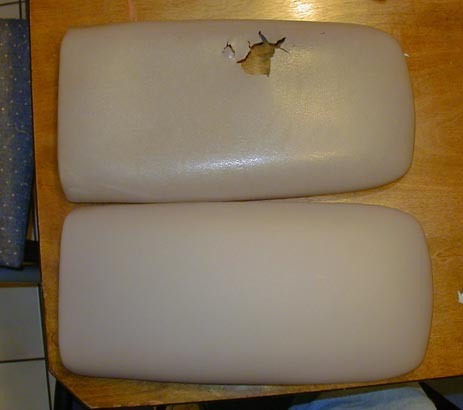 The first picture has the lower plastic base installed still and the second picture is of the lid without the lower base. 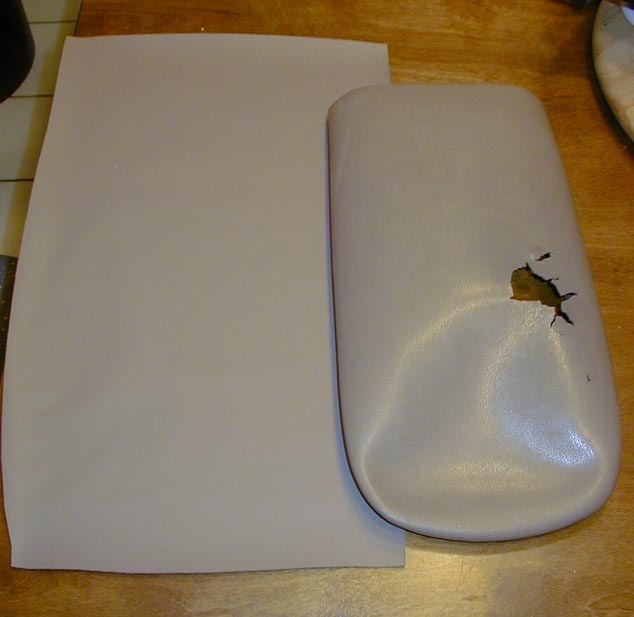 There is a thin foam pad layer between the lid and the base. On the "up" side this foam is much thicker. 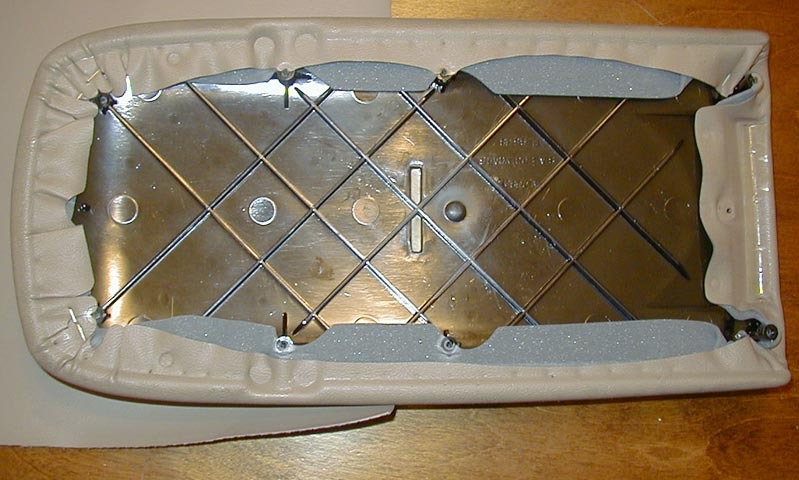 These two pictures are of the underside of one of the rear corners. 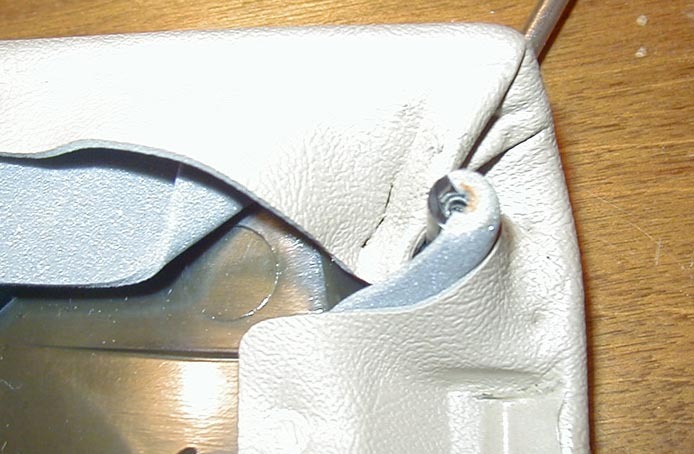 Only like 2 staples hold the vinyl in place in each rear corner. Not sure exactly why it didn't slide around. Not much keeping things tight. Here is one of the front corners. Again, only two staples hold things in place. Old cover vs new cut. There is a hint of difference in color. I attribute this to my never cleaning the lid cover. Ever. I do a lot of hands on work so it probably has plenty of grease and grime built up over time. Ahh... now we are getting somewhere. I used an air stapler (cheapo $45 from menards) to staple the new vinyl in place. This took the longest time of this entire recovering project since you have to pull it tight, staple, pull and fold and staple again, etc until there are no folds on the visible (top and sides) part of the lid. Last picture is of course the new covered lid below the old cover with the hole in it. Now here is the lid reinstalled in my truck. As I mentioned before there is a slight color difference. A week or two of wear and tear on the new lid and I am sure I won't even notice it let alone someone who isn't looking for a difference. I special ordered the matching vinyl for this project. Took a couple of days to get in. The color is M. Prairie tan. Total time for completion from begining removal to finish re-install was about 1 hour.